House Speaker Gloria Macapagal-Arroyo couldn’t contain Thursday her gratefulness to Public Works and Highways Secretary Mark Villar for a number projects the latter’s agency is implementing in her home province of Pampanga. The project launched Thursday were flood- and earthquake-resistant bridges which, officials say, could spur growth in Pampanga and Bataan through safe and reliable roads. 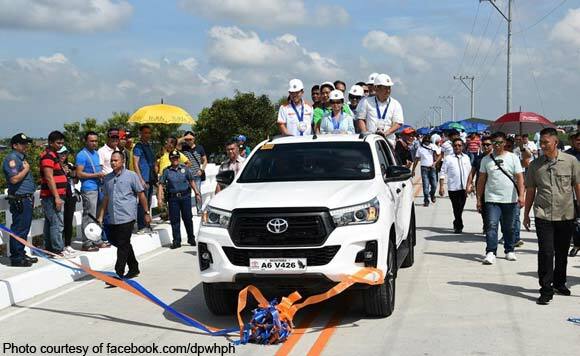 Arroyo, Villar, Pampanga 4th District Rep. Juan Pablo Bondoc and other local officials unveiled a marker and held a ceremonial drive-thru to inaugurate the new Pasac-Culcul Bridge 1 along Sto. Tomas-Minalin Road in Minalin town, and the Samal Bridge along Jct. Layac-Balanga-Mariveles Port Road in Samal, Bataan. Arroyo, who is Pampanga 2nd District Representative, expressed also her advance “thank you” to Villar for his expected return in Pampanga next month for the launch of a flood control program project in the province. Moreover, the 71-year-old politician, who was president from 2001 up to 2010, credited Villar for allotting funds for the construction of the 29-kilometer road linking Lubao, Guagua, Minalin and Sto.Tomas towns. She appealed as well to the agency to conduct a study for a bridge project in the province that may be funded by China’s official development assistance.